With the Beauty Blender Original you apply foundation, blush and powder in a simple and professional way. From now on it will be easier to reach hard to reach and narrow contours of your face. The unique design ensures a flawless and even complexion and has an ultimate reach. The Beauty Blender will achieve a professional and streak-free result. The first rimless sponge in the world. The special shape of the Beauty Blender allows you to perfectly match all contours of your face with a professional streak-free result. It is a soft sponge to apply make-up on the face. The unique design and structure creates a spotless and even complexion. Foundation and blush can easily be applied with the Beauty Blender. The ovoid sponge forms perfectly to the contours of your face. The narrower top makes it easy to reach hard-to-reach areas such as the nose and eyes. The wider side can be used for larger surfaces. In 2014 he was awarded a Beauty Expert award from Allure magazine. The sponge consists of 100% latex-free material with a very fine structure. Beauty Blender opts for safe, water-soluble dyes that are not harmful to the environment and will retain the color of the foam. 2. The sponge will now be twice as big! 4. Now the Beauty Blender is ready for use. 7. Are you ready? Let it dry at room temperature in a well-ventilated and dry room. This prevents the material from stitching. 9. Simply and professionally apply foundation, blush and powder with the Beauty Blender. Note : A new Beauty Blender may lose color in the beginning if it becomes moist. This is normal and belongs to the properties of the Beauty blender. 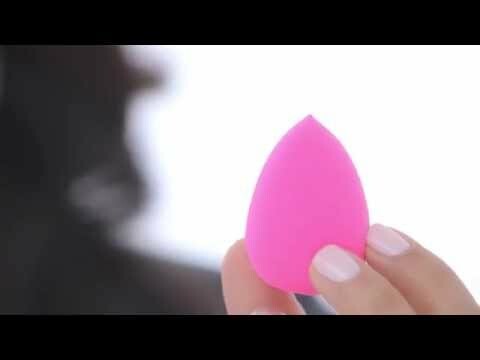 You order the Beauty Blender easily online at Boozyshop! Also check out our complete collection of make-up sponges or curious about the entire Beautyblender collection? At Boozyshop you will find everything to complete your makeup stash, see all make-up brushes quickly.